Still … the Wall Street Journal asks “Where are those papers?” … the Politico, on the other hand … looks for redemption. We are happy its still in the news. The rest of the press corps may have moved on, but we’d still like to know. All the more so because former Countrywide Financial loan officer Robert Feinberg told us last fall that Mr. Dodd knowingly saved thousands of dollars on his refinancing of two properties in 2003 as part of a special program for the influential. Mr. Feinberg also reported that he has internal company documents that prove Mr. Dodd knew he was getting preferential treatment as a friend of Angelo Mozilo, Countrywide’s then-CEO, and Mr. Feinberg has offered to provide those documents to investigators. This past year was not a particularly good one for Sen. Chris Dodd. Wall Street crumbled as Dodd distracted himself with a failed presidential bid. And some of the financial titans who helped fund his campaign sit atop the very firms at the center of the collapse. Top that off with revelations that a chief executive at Countrywide — a firm at the head of the mortgage meltdown — reportedly cajoled his colleagues into offering Dodd special terms on a home loan. So redemption is the Dodd theme in 2009. Dodd: We Senators are kinda like war heroes. Disgraced Senator Dodd is gambling that his "cushy" VIP mortgages will soon be forgotten by his constituants. 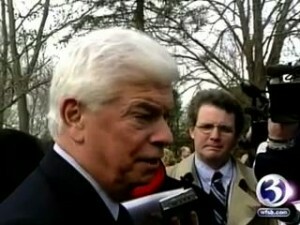 If Dodd were a Republican, he would have been forced to resign. If his role as a Senator and Chair of the Banking and Finance committee and this sweetheart deal is not a conflict of interest, then there could never be a conflict of interest. Resign now Mr. Dodd. You are an embarasment. This "situation" with Senator Dodd demonstrates how "our" elected officials and those that they hire as employees think nothing of thumbing their nose at the citizens of our town, city, state and country. What ethical code is Dodd following? Isn't there an obvious conflict of interest here – with Dodd overseeing the bailout of his lender (and thousands of others) from whom he received major campaign contributions? At the very least, immediate and complete disclosure is required! Since Dodd has failed to make approrpriate disclosure, he must resign!